Free remotely generated online roof reports for insurance adjustors and roof estimators keeps them safely on the ground and expedites their workflow. Currently this data costs the customer $40- $140 per address. It is cost prohibitive for the customer to use this technology for every roof job. If it were free (advertisement driven), the customer would use this technology for every roof job. 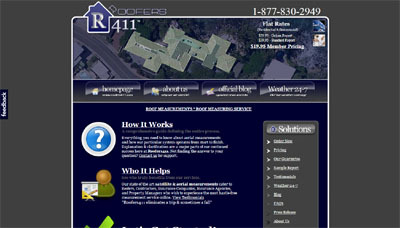 Roofers411.com will be offering free reports in Q2 of 2013. The advertisement opportunity for the roofing industry is without equal as this report will be both timely and targeted. The report reaches their potential customers just before they make their purchasing decisions.